October 5, 2013 — There’s one thing that my wife has always told me about watching horror movies: “I can take gore. I can’t take tension.” That means she’s okay with a machete half buried in somebody’s jugular pressure-washing the camera lens in blood, but she can’t for the life of her take a creaking closet door. And my experience watching horror movies with her has borne that out. She made it through The Fly fine. Hellraiser, no problem. But she made me turn off Phantoms after 20 minutes. Right, I know. Ben Affleck was the bomb in Phantoms, yo. But Re-Animator, well, it might’ve just called her out. So here’s the deal with this piece. Every year we make my wife watch a horror movie from the 1980s that, due to her age, taste in movies, and lack of a cool friends growing up, she’s never seen. 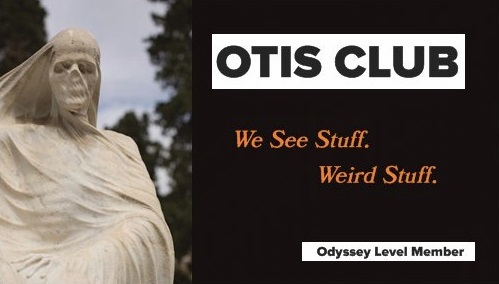 And I mean “we make” because I often get you to vote at the OTIS Facebook page for which movie she gets subjected to. 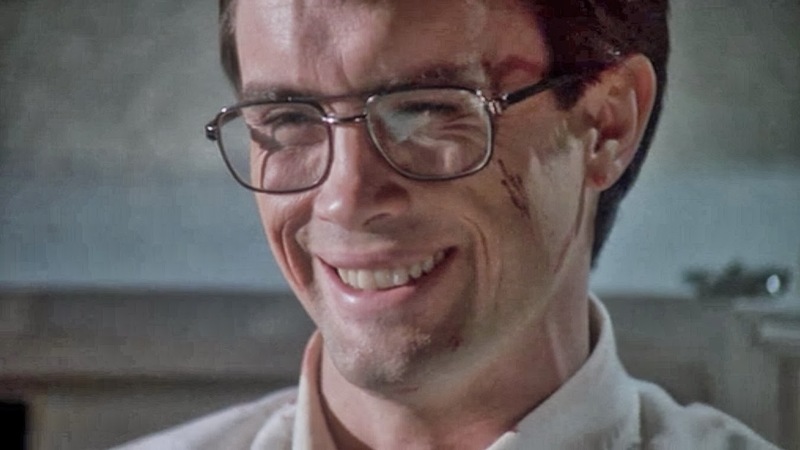 This year, you chose Stuart Gordon’s 1985 Re-Animator over both the 1984 Children of the Corn and the 1986 House. You showed my wife no mercy, and I really appreciate that. Anyway, what happens is we watch it together, and then I ask her a ton of questions about her experience with the movie afterward to get a unique perspective on it. And these questions aren’t for show. I really want to know the answers. After all, it’s also a test for me. These films are treasured memories from my life. Am I right about them or prejudiced by a younger, more idiotic me? Was I just following the belief set of the general horror community? Does it survive time and my own changing tastes? So here goes. 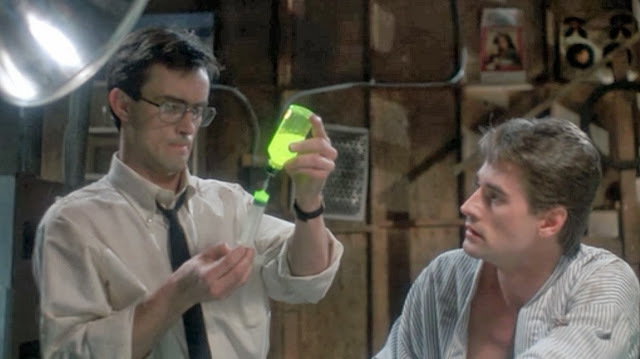 Herbert West is pulled into a fog machine by a living intestine, Dan Cain takes his dead girlfriend and starts to inject her with reagent despite all he’s learned in the movie, the screen fades to black except for the glowing green solution, which finally winks out. A scream. Credits roll and a theme ripped mercilessly from Psycho’s own violins plays us out. ME: So, what did you think? Just generally. ME: Really? Your body language told me otherwise. And, by the way, it speaks with a lisp. WIFE: I mean it wasn’t drawn out, had a good pace, good effects, interesting story. Put it this way…at no point was I bored enough to wonder how much longer a scene was going on, and I was never waiting for the movie to end. It was a nice little story…well, not nice, but interesting. ME: But, despite what you always say about gore, it definitely got to you this time. I started keeping track of the more explicit scenes you reacted to, just as a matter of course, until it turned out you were reacting to all of them…except for the finale. You nerve endings were dead by that time, I guess. ME: Actually, let me put it another way before you respond. You went from good-naturedly joking at the beginning of the movie when the first scene started in Switzerland, “You didn’t tell me it was a foreign movie,” to about 20 minutes later asking me plaintively “How much of this is there going to be in this movie?” And by “this” you meant gore. WIFE: No, I didn’t mean gore, specifically, just the morgue and autopsy stuff. That really got to me. ME: So medical gore you can’t take. Murder gore, supernatural gore, any other kind of gore’s okay. ME: I’m not sure that’s a legitimate line you’re drawing there. WIFE: No, it makes sense. You’re just not seeing it. ME: So, going into this movie, did you have any preconceptions about it? An image, a summary, a scene, anything? WIFE: No, all I had was the title. From that, I just thought it would be excessively gory. So I was wrong about that. WIFE: It was gory, yeah, but not excessively. The gore fit in the story well. It was never just there for no good reason. During the movie, I also thought that West was going to perfect his serum. That it would work for a while, things would be good for him, and then it would all fall apart somehow. ME: Yeah, that’s probably how most movies would’ve gone. WIFE: I’m glad it didn’t. ME: So, since you liked the movie, what was your favorite part? ME: I didn’t mean that question literally. ME: Ha. 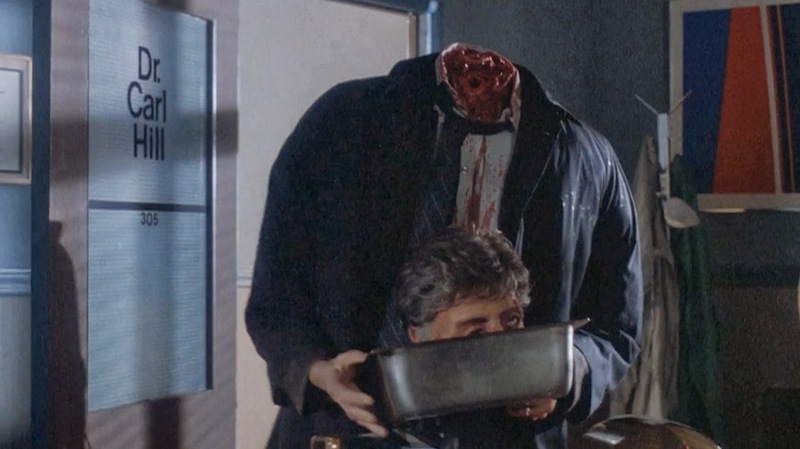 “Headed toward.” Yeah, it seemed to me like you were having a huge problem with the gore until the finale...which basically started with the headless doctor….wait a minute…they did go to worse places after that. The severed head giving head is the most infamous scene in the movie. ME: I don’t know. It’s just the scene that seems to stick with people. I feel weird having to explain this. WIFE: It was definitely revolting. But the entire movie was that way. What’s so different about that scene? ME: Just seems like they pushed a boundary there. Or how about this, most of the revolting-or-whatever-you-said parts of the movie came from impossibilities…reanimating a cat with a broken spine, shoving an electric bone saw through a reanimated corpse. But victimizing a woman like that is a more realistic and uncomfortable type of horror. WIFE: It was a living severed head drooling blood on a naked girl. I don’t know if that’s a legitimate line you’re drawing there. ME: Man, people are going to read this conversation. So did you find the movie cheesy in any way? It’s an 80s movie, after all. WIFE: Cheesy? Not really. I don’t think I would have reacted to it if it were cheesy. I mean, there was obviously humor to it and the scenes were out there enough that they could be seen as ridiculous if they hadn’t been filmed and played so well. ME: Yeah, honestly I was surprised at how good it was. It’s been a while since I’ve seen it and anytime I show somebody a movie like this under these circumstances, I find myself really cringing at the bad parts since I just told this person who trusts me how good this movie is. 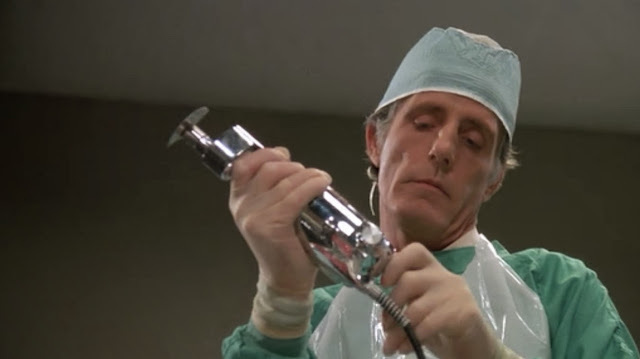 But Re-Animator holds up, I think, in just about every way. What about dated? Did you find it dated? WIFE: Not really. The score was classical and the outfits were pretty straightforward, especially since it was mostly medical scrubs and lab jackets. They didn’t seem to be trying to be too trendy with their references and stuff, so it’s aged well. ME: What was your least favorite scene? WIFE: I hated the autopsy scenes. The Q-tip in the forehead and ripping that scalp off. 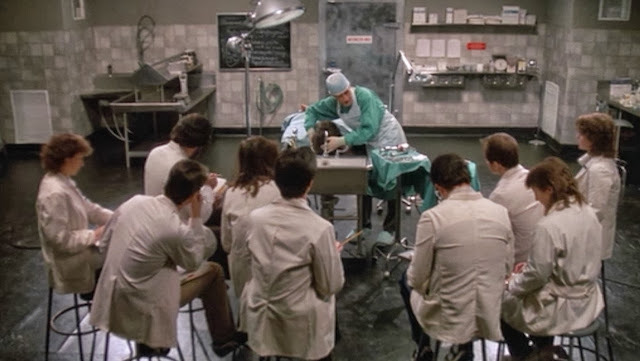 It was that scene that kind of told me what this movie was going to be about…lots of medical gore. All right. I probably didn't need this picture to illustrate what she said. ME: Still kind of doesn’t make sense to me, so I’m glad we’re back to talking about the gore. So what’s the goriest thing you’ve seen, just to give us some context on your reactions to this movie. WIFE: I don’t know. The Fly, maybe? A couple of scenes from The Walking Dead. ME: No way, I’ve shown you way worse than those. What about Texas Chain Saw Massacre? I mean, it technically wasn’t gory, but you always come out of that one thinking you’ve been bathed in blood and dried off with skin. WIFE: I’ve never seen that movie. ME: What? Of course you have. I’ve shown everybody in my life that movie. WIFE: Thanks. Not me. Maybe that should be next year’s horror movie. ME: No, we can’t wait that long. It’s like finding out the guy who married you wasn’t legally able to do so and our marriage is illegitimate. We need to watch it soon. ME: …and then Dennis Hopper is in the second one and there’s this big chainsaw duel, but that’s a whole other story. Anyway, back to Re-Animator. So what did you think about Jeffrey Combs? This is the movie that kind of started him as a legend in the horror world. WIFE: Which one was he? WIFE: Oh, I thought he was well-cast. Very creepy. I would never let him be my roommate. But they were all really well cast. My favorite character was probably the father after his lobotomy. Something extremely sad about him. Like the cat scene, just very sad. Not as creepy to my wife. ME: Yeah, the cat scene was another point in the movie where you were semi-covering your eyes for. What if I would’ve suggested stopping the movie at that point or one of the other difficult scenes for you? Would you have been for that? WIFE: No, I wouldn’t have let you. I did like it. A lot better than many of the other horror movies you’ve shown me. ME: In that case, why don’t you rank the three you’ve watched for the OTIS Halloween Blog over the years from favorite to least favorite: The Fly, Hellraiser, and Re-Animator. 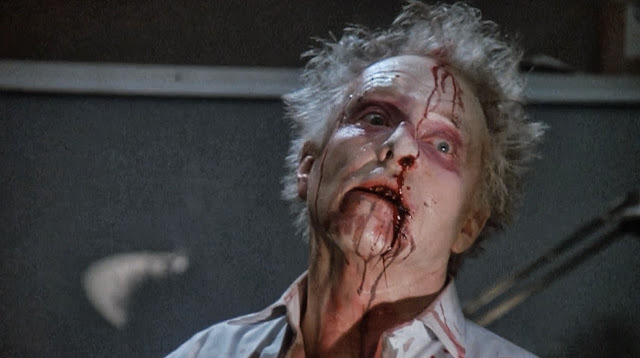 WIFE: The Fly is first, then Re-Animator, then Hellraiser. ME: Ha. You’ll never get over Goldblum, huh? ME: I’m okay with. So I think that’s all I have. I don’t know, I feel like I’m getting mixed signals from you with this movie. I mean, I was kind of joking about not seeing the difference between medical gore and other gore, but realistically, if you’re drawing lines, at some point, you can’t say that you can “take gore” anymore without caveating it like crazy. WIFE: Maybe it’s the electric bone saw. I can’t take electric bone saws. Maybe any kind of bone saw. ME: Guess my Christmas shopping is done for you then. They have those on Amazon, right? 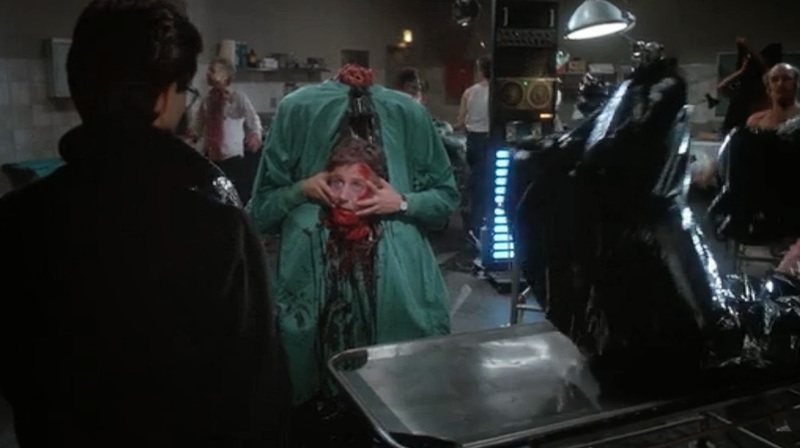 PS: We watched Re-Animator on Wednesday. The very next night, and almost completely out of the blue, I found myself on the phone with Jeffrey Combs himself. It was like a Halloween miracle. I’ll tell you about that in the next few days. Meanwhile, check out his Kickstarter for a new Poe movie. If they don't get the funds by November 1, it doesn't happen.